It's the Hilarious Headline Card Game! This game is a little different: you're dealt a hand of cards with words on them, each with a point value. When it's your turn, construct the headline that earns the highest points... and often the biggest laughs! The first player to get to 500 points wins. It's a great way to have fun with language for kids and adults alike. Compact enough to go on the road, this game is Extra! Extra! fun. 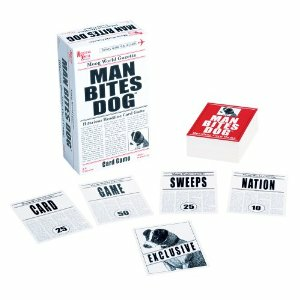 Comes with 106 Headline Cards, three Exclusive Cards and an Instruction Card.